Alright Planelopnik fellows. Who can tell me what this is? 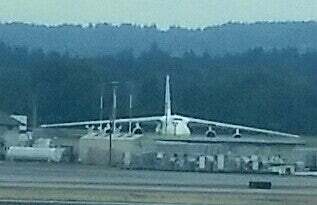 The bulbous fuselage and high cockpit suggest nose-loading, and the anhedral wings make me think of the Russian cargo planes, for some reason. There’s also that retarded part of my brain saying C-5, but I’m pretty sure it’s not. Looked like civil colors.